So, as you know, I now have a small person occupying my time so I haven’t blogged for a while, but this place is just so damn good I wanted to tell you all about it. And run by this fabulous lady who The Chef actually fell in love with, and who walked round all night filling up our wine glasses and offering out limoncello, with words of love and laughter. Now, I didn’t think London could possibly produce a better fun Italian restaurant than Giuseppes in Borough – I mean, when it comes to atmosphere, Giuseppes always has me up dancing by the end of the night – arms round a group of people I only just met, warbling out old love songs on the microphone and listening to Frank Sinatra while sipping limoncello. 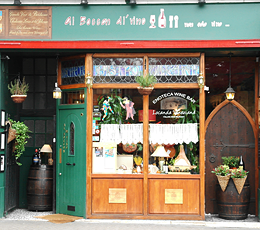 But Al Boccon Di Vino has atmosphere in spades and is the most incredible authentic Italian feast. First, it has to be said it’s great for Richmond, which I’ve always found disappointing food-wise. Richmond is sooo beautiful – overlooked by the deer of Richmond Park as the sun sets over the Thames that runs through it. It should be filled with fabulous eateries and river-side pubs. And yet it seems more to be filled with Zizzis and Stradas and such like, and a mixture of hooray henrys and wobbling young tykes bound for Be At One. But this place is an institution. It doesn’t care about money, and as such there is no menu, but you squash in next to your neighbor (who you are likely to get very well acquainted with) and are served a veritable banquet of food, like an Italian wedding feast. The meal was fabulous. Fabulous! A real event, a showpiece meal served with a feeling of joy and community. The cooking was fantastic in the most part brilliant. All I would say is that the scallops were perhaps a bit overdone, but the rest of the meal was incredible, and generous in it’s cooking and presentation. The cost for all this? £40 a head, which is quite ridiculous when you think of the amount of food and the quality of the ingredients. But as they say, they don’t do it for the money. We went for the house wine (2 bottles given how long we were there and, well, because we don’t get out much) and this was fantastic, particularly the white, and it comes in at £25 per bottle. I can’t recommend this place enough, although suggest you don’t go as a surprise as you’ll need to set aside tons of time and don’t eat for say a fortnight or so beforehand. Prepare to be full, happy and a little sozzled by the end. It would be a GREAT place for a group for a birthday or similar. This entry was posted in 2. CONNECT - Bars, restaurants, pubs, supper clubs, coffee shops, Best for date night in London, Best Of London (IMHO) and tagged Al Boccon Di Vino, feast, Italian, restaurant, Richmond, South London, West London. Bookmark the permalink. Love Their Food. Always recommended .